Another of my LONG overdue reviews…Pixelocity Software’s Disc Drivin’ is a game that I’ve been playing on a daily basis since December of last year. 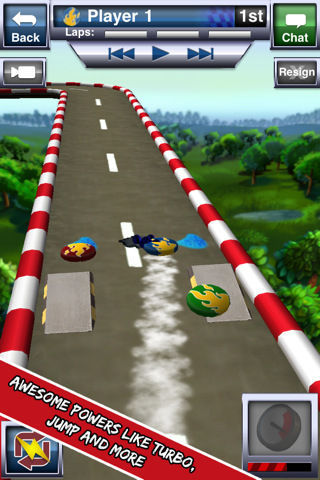 If you are unfamiliar with the game, it is a 3D turn-based racing game where you take turns flicking a Frisbee-like disc down a track trying to be the first player to complete three laps. I know what you are probably thinking, and while a turn-based racing game might seem like an odd paring at first, it works quite well! When you consider it, it’s actually not that much different than your standard boardgame. In fact, Disc Drivin’ could easily be classified as a kart racing boardgame. The game’s 15 tracks look very much like your standard kart racing locales with loads of twists, turns, bumpers, barriers, ramps, oil slicks and the like. 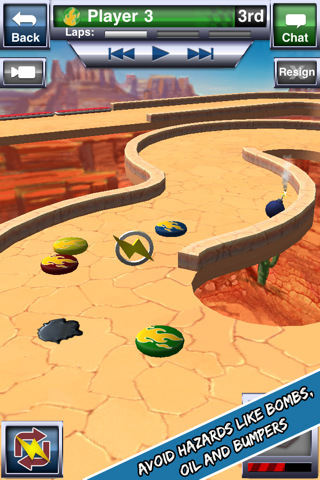 No racing game would be complete without power ups and in Disc Drivin’ you have access to six of them, which recharge as you progress around the track, or run over a special “recharge” pickup. They include a turbo boost, bombs, oil slicks, instant jump, brakes and an invisibility power up that lets you glide seamlessly through obstacles. Timing and use of these special tools can mean the difference between first and second place. Gameplay is simple; when it’s your turn, you drag you finger left or right to change the direction of your shot, then swipe your finger forward on the screen to launch your disc. It will go racing around the track in the direction you selected, with its speed based on the power of your flick. Then it’s the next players turn. Racing games are clearly about the multiplayer experience, and the folks at Pixelocity have given you plenty of options on how to set up your matches. By signing up for a free Disc Drivin’ account (right on your iOS device) you can compete with up to four players online or locally with Wi-Fi or Bluetooth. 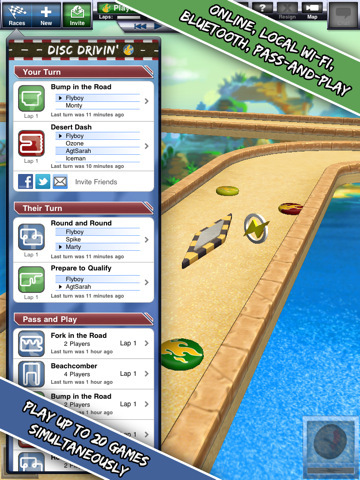 Alternatively, if you are off the grid or have access to just one device, you can race with up to 8 players on a single device via pass-and-play. Strangers, friends, or frenemies, you can challenge them all and starting a new match is very easy. Since the game is turn-based you can make your move whenever you have time and you can have up to 20 simultaneous online games. At a glance you can quickly see what place you are in and by zooming out, you can see where everyone is on the course (if you squint). Optional push notifications will keep you aware of when it’s your turn to play. On the whole, the game’s swipe control scheme works quite well and the physics engine behaves as it should. That being said, there are definitely more than a few times when a disc’s odd bounce or crazy unexpected behavior will leave you scratching your head saying “what just happened there?”. Even after repeat viewings using the game’s instant replay functionality, will not help you make sense of what just happened. However, I’d argue that these glitches are part of what give Disc Drivin’ its undeniable charm. Sure, sometimes these glitches will burn you, but other times you will pull off a monstrous feat that will defy all logic. Rest assured that Disc Drivin’s karmic forces have a way of evening themselves out, and these events are usually what you’ll end up laughing about on twitter and on the in-game chat. That being said, one aspect that needs some fixing is the syncing with the server at the end of a turn. When you complete your turn in an online match, your move is submitted to the server. From what I experienced on the iPad release, this is nearly instantaneous, but unfortunately on the iPhone release, this can sometimes take more than a few seconds. And if you jump the gun and hop back to the game selection screen during this process, then you’ll have to return to the race, watch a replay of your last move and then wait for the submit to occur again. I wish that the developers could find a way to background this task and eliminate the delay. Disc Drivin’ is available in three flavors, a FREE ad-supported iPhone release, a $1.99 ad-free iPhone release and a $2.99 ad-free iPad release. While those hoping for an universal release will be a bit disappointed, the good news is that all of these versions can talk to each other just fine, allowing you to start a game on one device and resume on another simply by logging into your Disc Drivin’ account on the new device. If you have an iPad, then boy are you in for a treat, the layout and UI of this version of the game is spectacular, and seeing those larger than life discs racing around the track is so much fun. The thing that I really love about Disc Drivin’ over other turn-based games is that turns literally take no more than just a few seconds to make. Sure, there is some strategy involved as to what angle to shoot and whether or not to use a power up, but you wont be spending 30 or 40 minutes agonizing over what word to play, you just aim, flick and enjoy. Both charming and fun, Disc Drivin’ is a MUST HAVE for any iOS device owner and you owe it to yourself to at least download the free iPhone version. Before you know it, you’ll have 20 consecutive games going and you’ll be a Disc Drivin junkie…just like me.